This is all good when I had class afterward. But I've got to actually work now and go to the gym after work. How do you guys handle your reading addiction and stay awake during the day time. Does this happen to you? I feel like crap after I stay up late reading or doing whatever - but I just push through and crash the next night as early as I can. I try not to do it anymore though. The body can't take it! Mine certainly can't take it. It happens to me all the time! I usually stay up until 1 a.m so when I have to wake up super early I always feel like crap. I always have a mug of strong black tea in the morning and try to take a nap when I get back home. I usually read before bed. Maybe that's a mistake. I'm not sure. I was reading Lover Unbound. I just couldn't put it down. I kept saying, "okay 15 more minutes." Next thing I knew it was 4 am. Complete fail. 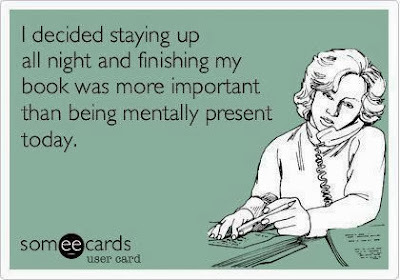 I only let myself stay up late reading on Friday and Saturday nights during the school year. I have to have my sleep in order to have the patience I need to deal with the students. I love them but they are really frustrating sometimes. I know what you mean. I was better at going to bed when I was a teacher. But maybe that lesson took me a couple tries to learn as well. I get really really sleepy around 2ish. The problem is that I run an "after school program" I go get the children at 3. I am so afraid that I will fall asleep and not get them! That would be horrible! Lol. That probably wouldn't go over very well. Set a phone alarm just in case. I'm trying to stay away from coke as well. That's another addiction. I agree about the sugar. I do this all the time and hardly ever get sufficient sleep. I've just learned to cope. The addiction to the written word can be powerful! It is truly an addiction. I can't do it anymore either! Before I started teaching, it was easy to stay up. No more, though. It's been really hard to get in the habit of going to bed when I'm tired, but I figure it's a trade-off - more reading time in the morning. It isn't working. I'm not the type of person that can read in the morning either. I have one of these kinds of days all the time!